WASHINGTON (CNN) - President Barack Obama said Saturday he wants to make additional resources available for overhauling the nation's health care system by dramatically reducing current medical costs to the government. 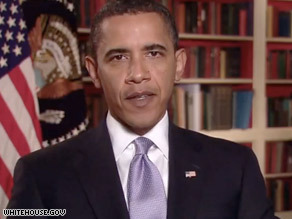 In his weekly radio and Internet address, Obama proposed $313 billion in cuts and new savings over the next decade. Some of the funds would come from from expected increases in efficiency, reductions in excessive hospital payments and drug cost savings from individuals enrolled in both Medicare and Medicaid, the White House said. But he did not specify precisely what form much of those cuts might take, saying the new savings would "come from commonsense changes." "For example – if more Americans are insured, we can cut payments that help hospitals treat patients without health insurance," he said. "If the drug makers pay their fair share, we can cut government spending on prescription drugs. And if doctors have incentives to provide the best care instead of more care, we can help Americans avoid the unnecessary hospital stays, treatments, and tests that drive up costs." The funds would be in addition to the $635 billion in spending cuts and tax funds Obama has already requested to help ease the transition to a new system that would cover uninsured Americans and do a better job of slowing the surge in medical costs. Budget chief Peter Orszag told reporters Friday the combined total savings would cover the cost of the process, though outside experts have estimated a price tag that would likely exceed $1 trillion. "We are making good on this promise to fully finance health care reform over the next decade," Orszag told reporters on a conference call, though he would not dismiss the prospect of additional future costs. Orszag conceded there might be a need to generate "additional resources that are necessary, and we would work with the Congress to come up with them if they are, but we haven't seen [those costs]," he said. "The committees are still writing the legislation, and the precise cost involved has yet to be determined. What we wanted to do was put enough specificity on the table to get in the range." The president's latest proposals, like his earlier cost-cutting suggestions, would still need to get a congressional seal of approval — a hurdle that may be tough to clear. "These savings underscore the fact that securing quality, affordable health care for the American people is tied directly to insisting upon fiscal responsibility," said the president. "And these savings are rooted in the same principle that must guide our broader approach to reform: We will fix what's broken, while building upon what works. "I know some question whether we can afford to act this year. But the unmistakable truth is that it would be irresponsible to not act." The president's comments come amid a fresh administration push on health care. Obama held a town hall in Green Bay, Wisconsin, on Thursday that focused on the issue. On Monday, he will address the American Medical Association — a group that has long been skeptical of his health care agenda.